Everyone on the Viking Team is carefully selected based on their enthusiasm, professionalism, and experience. Our pool of highly qualified coaches includes athletes, teachers, established coaches as well as undergraduate and graduate college students. Every Viking coach is dedicated to helping children learn and play sports in a supportive and nourishing environment geared towards fun for all. 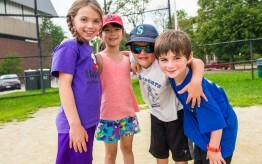 For our Summer Camps, we comply with the Massachusetts Health Department guidelines for coach to camper ratios as follows: 1 coach per 5 campers for children 6 and under; 1 coach per 10 campers for children 7 and older. All staff is fully trained, CORI & SORI background checked, and First Aid & CPR certificated. Our staff who run our inclusion programming are trained in working with children and adults with both physical and mental disabilities. In compliance with the CMR, parents may request to view a coach’s CORI and SORI results.